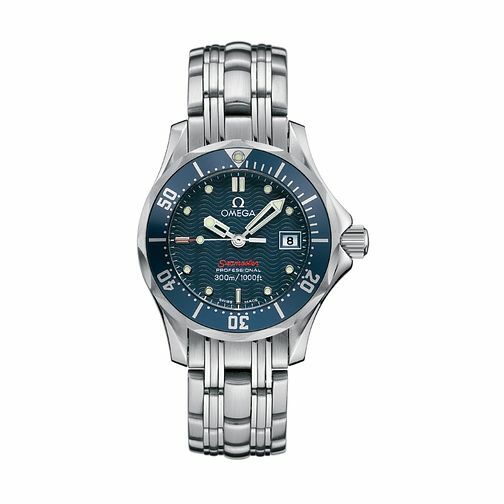 Fresh from Omega's Seamaster Diver collection, this ladies' watch is presented with a sleek stainless steel case and bracelet. A distinctive blue dial features a subtle wave pattern in homage to the Swiss brand's maritime legacy. A handy date display window sits at the 3-o-clock mark, with scratch and glare resistant sapphire crystal covering the face. This chic timepiece is powered with quartz precision movement, and is complete with an impressive 300 metre water resistancy. Omega Seamaster Diver 300m ladies' watch is rated 5.0 out of 5 by 2. Rated 5 out of 5 by Anonymous from A beautiful watch Both sporty and elegant, this watch really is exactly what I was looking for in a watch for life. It is so comfortable to wear, is the perfect weight on the wrist (I can barely feel I'm wearing it) and looks great. I would highly recommend!